This functionality is available for a while now, therefore it’s time for a blog! We recently configured this functionality, so I wanted to share my notes on this topic. So.. Let’s go! This blog won’t focus on detailed configuration steps as you can find these in the SAP documentation. Instead of that, I will address the findings that I think are worth mentioning. And some of them are not available on help.sap.com. Activating the functionality is (currently) executed via an SAP incident. For the Server-Side Integration, you will need the Enterprise user (license). 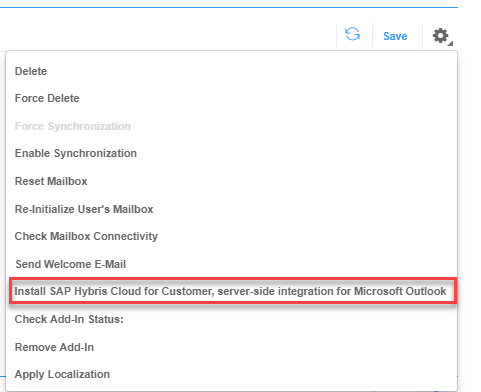 After the SAP support team has confirmed this, the regarding work center can be assigned to a business role. Installation of the plugin is pretty easy. Select the user (after provisioning) and select it to install the add-on. The functionality will be pushed to the user via the Exchange server. As standard it is enabled on the Exchange server that add-ons can be installed. If this is not the case; contact your Microsoft Exchange administrator. In my experience, possible errors when trying to install the plugin are pretty much unclear in what they mean. Most of the time they are related to double registered e-mail addresses in the system. They need to be unique. After the install, the user will automatically see the add-on in Microsoft Outlook. There are 2 ways for the users to logon. The user goes to the user settings, selects the email service (like Office 365) and enters the credentials. It is also possible to use Microsoft Exchange Impersonation based access. This means you need an Microsoft Exchange administrator. The administrator would need to configure a single account on Exchange which has read and write access on every mailbox that needs the integration. This way, no user needs to provide their Exchange credentials. One cool feature that I didn’t see in the help documentation (at least the last time I checked..) is that you can show extension fields in the add-on. Simply extend the extension field for the c4codata OData Service and it will be available in the add-on settings. Currently there is a limited amount of languages supported. Dutch is not supported for example, which means the add-on will automatically show the default language (US English). This also means the plugin will show 12-hour time instead of 24-hour time. Not handy, but hopefully SAP will fix this. The allowed maximum size for attachment synchronization is 4.88 MB. SAP support is able to increase this size (after consultation). The synchronization is started automatically every 30 minutes, which is a fixed setting. A manual sync is possible if users need to speed things up. The add-on is available in the Microsoft Outlook app on iOS. However when creating appointments, it is not possible to add a category (like in Outlook on the desktop version, see screenshot below). Without this category, the synchronization to C4C is not triggered. I saw on the Microsoft Outlook Feedback site that this is a generic wanted functionality. Hopefully Microsoft will add categorization to the iOS app in the near future. Hopefully the Server-Side Integration for Microsoft Outlook will be extended in the future. Integrated scenarios can be tricky, so a standard solution (with easy installation) is preferable. So far so good and it has lots of potential! Be sure to check out the ideas on the SAP Customer Influence site… and vote!